The San Francisco Mime Troupe does not do pantomime. We mean ‘mime’ in the ancient sense: to mimic. We are satirists, seeking to make you laugh at the absurdities of contemporary life, and at the same time see their causes. We travel the country and the world with our message of solidarity, comedy, and the plight of the worker in our increasingly corporatized democracy, and have done shows about most of the burning issues of our time – normally debunking the official story. And because we want our shows about the issues of the day to be seen by the people who are most effected by those issues- working class families who can’t always afford to the ticket prices at the other Tony award winning theaters – we perform most of our shows free in public parks, for tens of thousands of our fellow citizens every summer. So off we went, to join our fellow San Franciscans for a night of Drama Talk & Drinks! Katie: That was really fun to see a Mime Troupe Show! I highly respect them as a company, and it’s been years since I’ve seen one of their shows. It’s great that they still tackle very topical and important issues in their work. Nothing is more timely right now than the Black Lives Matter movement. Brittany: One of my favorite theater genres is social justice theater. I’ve always dug the work that was done during the WPA. Unions and political groups using the stage to pass on revolutionary messages through humor and art. I really appreciate that SF Mime Troupe is keeping that kind of theater alive. K: At times though, it felt like they took a complex issue and oversimplified it. There were some talented actors, but in trying to create such one-dimensional examples of bad-guys and good-guys, they limited the complexity of the characters. B: I guess that’s one of the failings of this kind of theater. I wasn’t expecting complex character arcs, so I wasn’t disappointed. K: True, I guess I just don’t prefer this kind of theater, but it was well done. I appreciate that this piece choose to show us long-term institutionalized injustices that compound over the course of a black person’s life. Systemic injustices that they endure over and over again, and then when they’re stressed, or fed-up, or what have you, they finally stand up for their rights and that’s when the events escalate to make an otherwise ordinary oppressive encounter turn deadly. B: I liked that they were blunt, that it didn’t have a happy ending like most musicals, and that they didn’t try to sugarcoat it, while they still somehow made it funny. The only thing I do wish is that there was a better call to action at the end. At the end of the play I wish the audience had jumped to their feet and had started chanting Black Lives Matter, because they were so moved by the injustices they saw on stage. I feel like that should be the ultimate goal of this sort of piece, and the audience just didn’t get there – they clapped – they were possibly intellectually moved – but they didn’t take to the streets. It didn’t have quite the oomph, or the solution. I guess there isn’t an easy solution, but I wish there was. The Verdict: Who doesn’t love a day in the park? Who doesn’t love free theater? 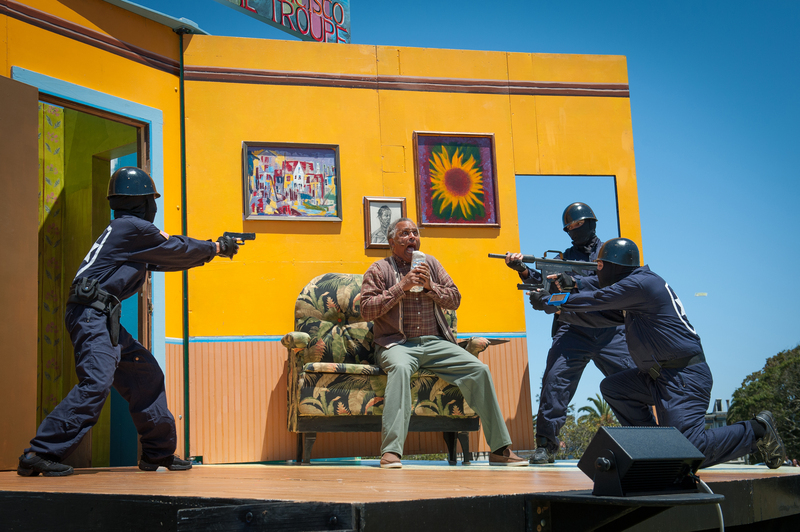 SF Mime Troupe’s Freedomland allows you to enjoy both, while being funny, topical and maybe even a bit revolutionary. Go see it when it comes to a park near you! The Drama Talk: They did a good job of using humor to lighten up what could be an incredibly heavy topic and made it accessible. The actors are uniformly talented, and for such a small cast (only 4 people) they convincingly play a wide variety of very different characters. The music is good, as is the band, but you don’t really leave this show humming a tune. It’s a show that makes you think, which is one of the best things theater can do. The Drinks: Since this show is normally in a park, we suggest BYOB (when allowed), but since we saw the show at the SF Mime Troupe space, we availed ourselves of the vino there. Post-show discussion after 8/15/15. No dogs, alcohol, or smoking allowed in park.